The sun is showing it’s face today and the snow that is still on the ground is packed hard and difficult to walk on. Seeing some warm sunlight definitely cheers the soul and drags it out from the shadows of the winter doldrums even if the temperature is 20 degrees. Sonny has told you about the new tractor and the guineas but he hasn’t given you all the story so thought I would give you my side. He called me from work on Thursday and said that he was going to stop by the Kobota dealership and pick up some brochures on his way home from work. I’ve been married to him long enough to know that that was code for “I’m buying a tractor today.” Sure enough he came home and told me all about the Halloween orange Kobuta tractor, what it could do for us and was excited about the deal he had gotten along with a bush hog. He didn’t have to sell me on it. We needed a work horse and this one will do the job and then some. Friday he and John went to pick it up. John’s truck had trouble pulling the load up the icy hill as soon as it hit our dirt road, so they unloaded it and Sonny would have to drive it the few miles home. The dealer said he would fill it with fuel but apparently forgot, so Sonny had to drive to the country store to fill it up. I am sure our neighbors thought he was daft riding this tractor in the frigid temperatures past their houses looking like an Eskimo riding high in the seat. More than likely he had a smile frozen on his face and not because it was cold. It was a man with a child’s heart playing with his new toy and that’s the way it should be. I enjoy seeing him happy. The cold didn’t affect him at all because he didn’t get off of it when he got home. He immediately put it into plow mode and scraped the driveway of snow. Saturday we took it up the hill behind the house to cut firewood from some of the fallen trees that were left behind from the select cut three years ago. I sat beside Sonny and hung onto the handle used to pull yourself up into the seat. It’s a steep grade up the hill and there are somewhat shallow drainage ditches across the logging road leading up. He put the Kobuta into four wheel drive and I was a little apprehensive as we jerked side to side dipping down into the gullies and up again. The tractor performed beautifully and Sonny is a pro at controlling it. 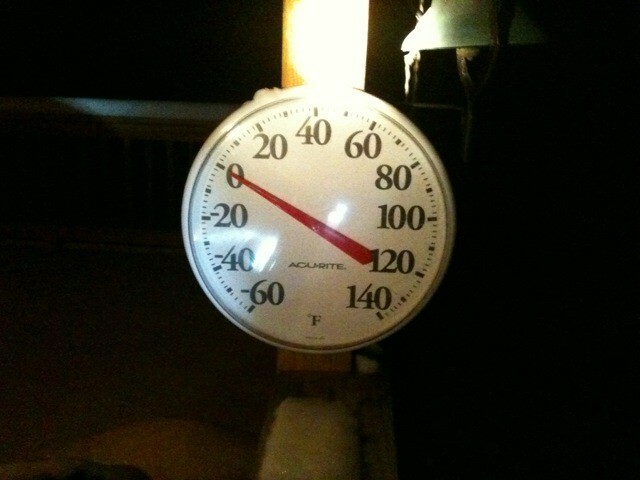 We were able to cut wood, stack it in the bucket and drive straight to the porch to unload. This tractor is worth every penny and will make so many jobs easier. I am looking forward to Sonny teaching me how to drive it and work all the attachments. 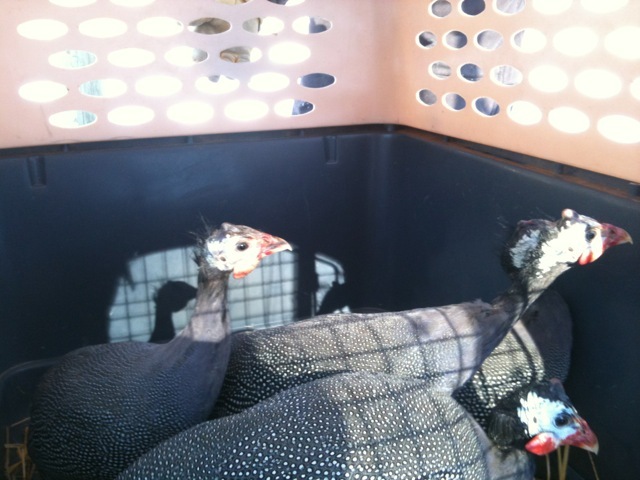 Our guineas are doing great. We let them out of their coop on Saturday. At first I thought we had lost them but sure enough they returned in the evening. Just not to their coop. They seem to like the pole barn and have been roosting under the roof near the attached garage. The chickens are not going to be happy because their dust bathing area is directly underneath and is now filled with guinea poop. The chickens haven’t met their cousins yet. It has been too cold to let them out, but I’m sure we might have a rumble on our hands as soon as they come across each other. 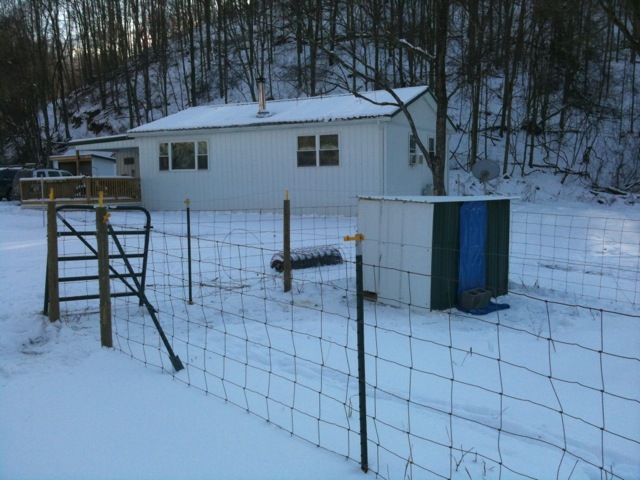 I suspect that the guineas like the pole barn because it is sheltered and they can roost up higher than in their coop. The guineas are getting used to me. They are an odd looking bird. Their lavender gray and white spotted feathers are pretty but as you look up the body toward the head you kind of go, eeewww. Their heads look like clownish vulture heads on skinny necks attached to hump backed bodies. The sound they make reminds me of a set of squealing brake shoes as you press down on the pedal. I try to make the same sounds and they come strolling out of the pole barn to say hello. They are still a little leery but are warming up to my presence as they realize that I am the food lady. As soon as the ground thaws and the bugs come out they will have a job to do. I feel like we are now well on the way to becoming a real farm. A small one but just the right size. Well after waiting a year and a half, we finally decided to get a tractor for our fledgling farm. We have been needing a tractor with a bucket for a while now. So yesterday on my way home I stopped by Parcs Kubota outside of Salem to figure out which one I wanted. The L series is a little bigger and looks more like a tractor then the smaller B series even though they have similar options. 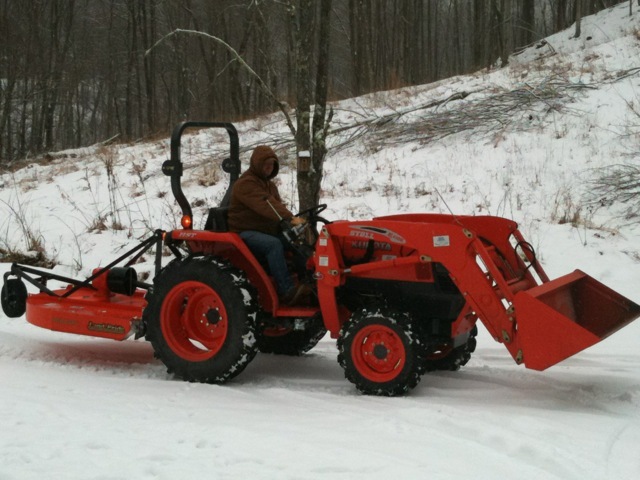 We wanted to be able to bush hog our back 40 and still be able to use it for large jobs as they come along. I decided on the L2800 30hp Diesel 4×4 with a front end loader. At the last minute I decided to also get a bush hog while I was at it. I called John and told him about it last night and asked if we could use his F-250 and his trailer to pick it up Friday morning. Lucky for me, he agreed. We got it loaded and chained down and headed up the road towards my place with no problems until we turned off the 2 lane onto the 8 mile long dirt road. We went about 1/8 mile and ran into trouble. Even his 4WD began slipping as we headed up the first icy hill. We just couldn’t make it pulling the trailer. After we slid down the hill and John was able to keep the trailer from jack-knifing we got the tractor unloaded. I drove it the rest of the way home. That also gave me a chance to spend some learning time on it without anyone watching if I goof up. 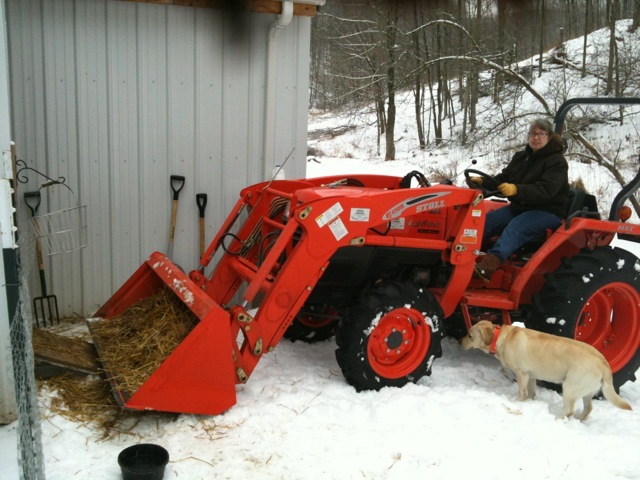 When I got to Pot Hole Farm I immediately got going clearing the snow off the driveway. Tomorrow we will need to get more firewood cut up and the buck will come in very hand for chunking the cut logs into. 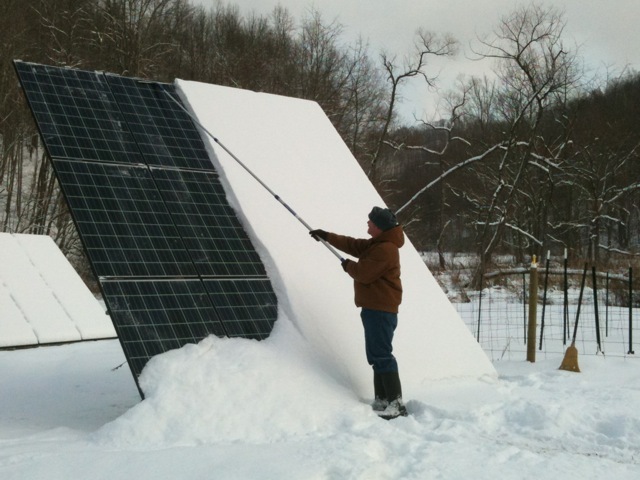 You are currently browsing the Off-Grid in West Virginia blog archives for January, 2011.